Mick was elected initially in 2004. He is married to Mary and they have five children. He is a member of the local GAA and Boxing club. 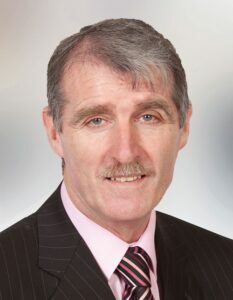 He is also Chairman of Ballyhocker and Ballaghadreen Mental Health Association. He is heavily involved in suicide prevention and in conjunction with the Community Development Group set up ‘Living Links ‘to support families effected in this way. He has lobbied extensively to secure a freeze on commercial rates and has lobbied for the realignment of dangerous roads in the area and has collaborated in the setting up of community alert groups for the benefit of the local community. He also played an instrumental part in acquiring a defibrillator and in the extension and upgrade of sewage systems in the local area. A very hard-working, effective local representative he also managed to secure an ambulance service for his locality.